Canister (Cartridge) OilFilter Element - This consists of an element inside ametal canister. The canister must be opened, and the new filterinstalled inside the cavity. This element may be a variety ofmaterials (metal mesh, synthetic, paper, or cloth) and will bemanufactured with micron ratings compatible to the OEMspecifications. Spin-On Oil FilterElement - Simple removal by spinning off and replacing theelement. Manufactured of synthetic, paper, metal mesh or cloth,with a micron rating which varies based on manufacturerspecifications. 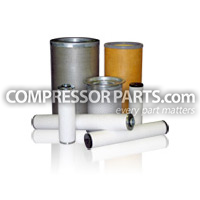 The proper selection and use ofcompressed air filters will prevent many short and long termproblems with your compressed air equipment and systems and saveyou substantially in down-time and component replacement costs overthe life of your compressed air system. Our Oil Filter Replacements come witha manufacturer's warranty that matches or exceeds the original OEMwarranty and specifications. Original equipmentmanufacturer (OEM) names are the trademarks of each manufacturer.On products marked "replacement," OEM names and part numbers arefor reference only.